After more then 35 years in the music business, Mike Tramp has released this acoustic album where he reflects on his life up until now. It’s a quiet album, away is the rock ‘n’ roll sound and left is a naked honest album from a man who has been around. Yes what you read is correct. I’m giving this album Cobblestone Street the maximum 5 hearts. It is rare, but the honesty this album delivers makes my decision absolutely fair. And what do we get to hear on the album? Well we get 10 new written songs. If you choose to buy the De luxe version you get 12 songs. All in the Scandinavian style where less is more. And why is that? It’s because on most of the tracks you only get to hear Mike Tramp alone with an acoustic guitar as his only companion, his backing band The Rock ‘Roll’ Circuz had the day off. On some of the tracks Mike Tramp’s old friend, and multi instrumentalist, Søren Andersen, delivers support by playing guitar, drums, harmonica and more. And what is Mike Tramp’s massage on Cobblestone Street? Well he is now a middle age man, born in 1961, who looks back on his life: Was he a success? Track 9 What Are You Gonna Do, did he get enough out of his talent? Track 4 Ain’t The Life I Asked For, was he a good lover, husband and farther? Track 4 Caught In The Storm. These are questions many middle aged men ask themselves in the middle of the night – so why not Mike Tramp? On the opening track, Cobblestone street, which gave the title to the album, he thinks back in time to the Copenhagen, district Vesterbro, he knew from when he was a child and a teenager. He reflects on the many changes from then to now. All the new faces and names and the fact that all the little shops has disappeared. A lot of fathers can relate to track 6 We’ll Be Alright. Its about a dad’s absents from his child, and here it doesn’t matter if its because of a dad like Mike Tramp being on the road a lot, or one busy working too much to really notice the children. To sum it all up, this album is not only for the grown up’s, even though they can relate to many of the problematic topic’s addressed on the album. If you want to hear a real rock ‘n’ roll voice this is it. It can only be highly recommended. Should any Eurovision fans be in doubt though; Mike Tramp has long ago left the sound we heard from him and the rest of the Mabel boys when they represented Denmark at the 1978 Eurovision Song Contest. 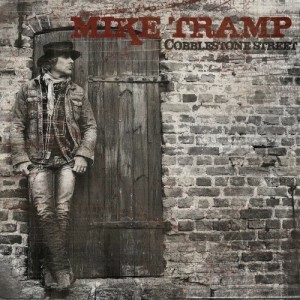 On this album you get the true and honest Mike Tramp, when he is at his best.